Hangar Flying A Dying Art Form? An issue of any aviation magazine does not ship to the printer without some reference to hangar flying. The phrase has been around nearly as long as aviation and is used to describe the conversations and discussions had by pilots sitting around a hangar. However, in my experiences, hangar flying is more often a myth then a reality and I was starting to wonder if this art form was slowly dying. The fact of the matter is less than a half a percent of the population are pilots. So although many people are intrigued by what we do, it can be hard to find people who want to talk about aviation for hours on end. When I was first learning to fly at Blue Ash Airport in Cincinnati, OH, I fell in love with hangar flying. The flight school had a couch that sat in a covered area outside the FBO office where you could sit and listen to and watch the activity on the airport. After a lesson I would sit there with my instructor to debrief and within a few minutes the crowd would grow and the hangar talking would begin. As a student this was a great way to stay motivated and also to learn from others. I wonder if without that bonding experience if I would have stuck with it, I like to think I would have but it is hard to determine the role the camaraderie at the airport played in my ongoing motivation. Unfortunately, since moving home to Chicago in 2005, I have been unable to find true aviation camaraderie around the airport. I can find it online but it was missing at the airport. I belonged to a flight club that, despite a healthy membership roster, did nothing to foster social activities between members. I came to the airport to fly then left right after. Finally fed up with that experience I went on the search for something better and came across my new club, Leading Edge Flying Club, which was created out of the same frustration I had been experiencing. This club focuses on the social aspect of flying. 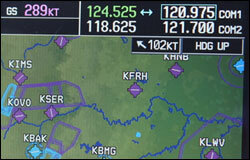 They offer monthly fly-outs to encourage pilots to share the costs of flying and to learn from each other. 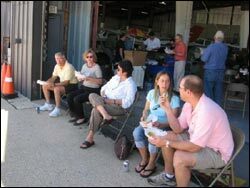 In the summer they organize cook-outs on the tarmac and most importantly, they offer a welcoming environment in the hangar clubhouse with a view of the flightline that encourages loitering. My previous club had metal chairs with their back turned to the airport that encouraged you to go home after flying. I now advise prospective student pilots that if their flight school does not have a couch, walk out. Beyond the benefits of enjoying aviation on the ground through hangar flying I am learning I am enjoying sharing flight time with a broader group of pilots from novice pilots to airline captains. This past weekend I participated in my second club fly-out. 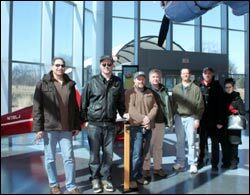 We had nine pilots who saddled up into four aircraft for a day trip from Chicago to Kalamazoo to visit the Air Zoo museum. This is a flight I could have done on my own but it would have cost significantly more and I would have been missing out on the camaraderie and a chance to learn from my fellow pilots. These types of activities will keep new and old pilots engaged in our community. With the decline in the pilot population I think it is important for us all to find a way to maximize our experiences in aviation. I would never have said my fire for aviation needed to be re-kindled but my experiences with Leading Edge have definitely stoked the fires. I am getting a lot more out of my trips to the airport now that I have found a club that offers more than simply access to a plane. Let's all do more to continue to make the general aviation community an engaging one and keep everyone active in the community.